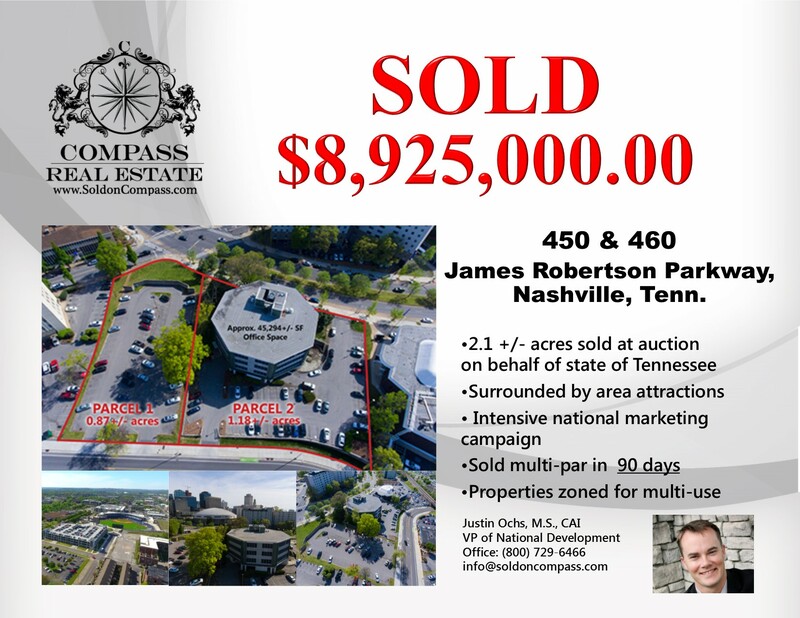 NASHVILLE (June 23, 2017) – Compass Auctions & Real Estate LLC, a Chattanooga, Tenn.-based auction and real estate company with offices in Tennessee, Georgia and Kentucky, announced an $8,925,000 sale of two large adjacent properties in downtown Nashville on Wednesday, June 21, on behalf of the state of Tennessee. The winning bidder will remain confidential until after closing on or before Aug. 7, 2017. The auction took place at the Hermitage Hotel and had more than 30 attendees. The properties, located at 450-460 James Robertson Parkway, include 2-plus acres located on the north side of James Robertson Parkway and Gay Street, with frontage on the south side of Fourth Avenue North. “We are exceptionally proud of the efforts of our team to bring this premier piece of real estate to the auction stage,” Holt stated. The properties include approximately 2.1 acres offered in two separate, but adjoining, parcels and as a whole. 450 James Robertson Parkway consists of approximately 0.87 acres (38,025+/- square feet), and 460 James Robertson Parkway consists of approximately 1.18 acres (51,296+/- square feet) with approximately 45,294 square feet of office space. The location is zoned in order to encourage a mix of compatible land uses that provide opportunities to live, work and shop downtown. 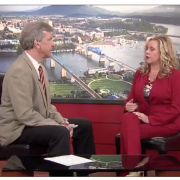 Compass Auctions & Real Estate, a woman-owned Chattanooga-based auction and real estate company, offers a host of auction and real estate services, including live, online and webcast auction events. The Compass team has over 50 years of combined experience with government surplus, heavy equipment, vehicle fleet, farm and ranch, estate, luxury asset, and charitable auctions. Compass is a certified woman-owned business and is headquartered in Chattanooga, Tenn., with locations in Nashville and Lebanon, Tenn., Atlanta, and western Kentucky.